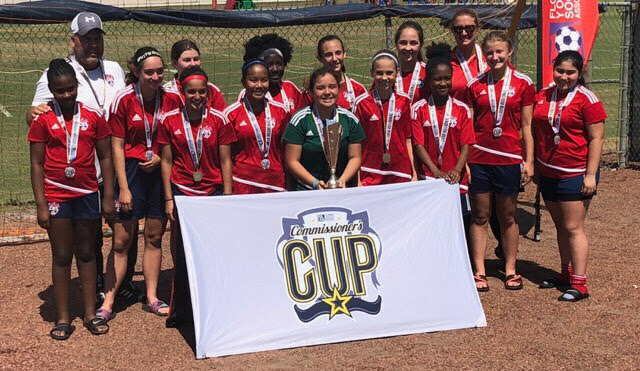 The Cutler Ridge Soccer Club would like to recognize the U14 Girls Team lead by Coach George for their superb showing at the Commissioners' Cup Tournament. The team won all of their matches in the Region A Tournament including an impressive 5-0 victory over the Palm Beach Garden Predators in the Region A Finals on March 25, 2018 at FAU. On April 21, 2018 in Auburndale, FL at 8am where they faced off against Florida Kraze Krush from Oviedo, FL where they prevailed 5-2 to advance to the finals on April 22, 2018 against Florida Premier FC. After a tough battle ended in regulation time with a 1-1 tie, the two teams continued into the first overtime period where the Cutler Ridge Fury went on to win 4-1. Congratulations to Coach George Maysonett and the U14 Girls!